Calphalon is a leader in cookware known for its cost-effective and durable products and the perfect pan to use to cook up some eggs National Egg Day on June 3rd. While food enthusiasts love to try and experiment with new recipes, the key to becoming a truly great chef is to master the classics. And what’s more “classic” than the perfect egg dish? Whether over-easy, scrambled, or as a simple omelet, we’d like to learn about your take on a classic egg recipe you love. 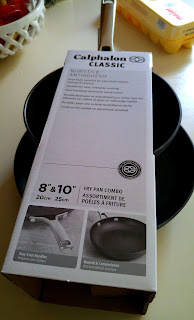 I was recently sent the Calphalon Classic 2-piece fry pan set to try out and come up with some fun recipes! These pans feature a dual-layer nonstick for easy food release and are made from beautiful, durable hard-anodized aluminum. With it being National Egg day, it was perfect to use these pans to try our some egg dishes. The flat, wide bottom and sloping sides make the eggs heat evenly and the nonstick finish is perfect for flipping the eggs and not having to worry about them sticking to the side! Totally the best pan for omelettes! The set includes both the Calphalon Classic Stainless Steel 8-Inch and 10-Inch Fry Pan Set which are perfect for everyday use. Not only is this the perfect egg pan, but it is great for sautéing vegetables, and browning potatoes, or for searing steaks, chicken, fish, or chops. 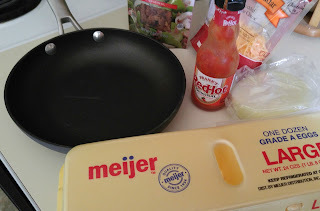 Create a one pan meal, but you want to add cheese to the top? No big deal, both the 8-Inch and 10-Inch Fry Pan Set are oven safe to 400 degree. So place your pan in the oven to get your cheese all bubbly on top! I do not own a dishwasher, but these pans are dishwasher safe as well! Hand washing is recommended to preserve the luster of the stainless steel. These fry pans are intended for gas, electric, electric ring, halogen, glass ceramic, or induction stove tops, and can be used with nylon, coated or wooden utensils. Crack two eggs (per omelette) into a small bowl and whisk with a fork until well beaten. Add 1 tablespoon milk, a shake or two of Red Hot, then salt and pepper to taste. 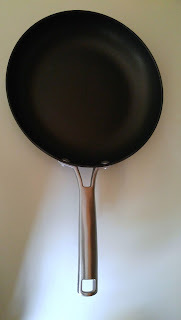 For taste, heat butter in your Calphalon Classic fry pan on high heat until very hot (approximately 30 seconds). Once the butter bubbles and browns, slowly pour in the egg mixture. Tilt the pan to spread the egg mixture evenly. Once the middle bubbles, tilt the pan again and shift the egg mixture toward the outer edges of the omelette. 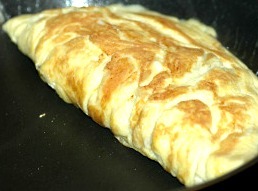 Fold 1/3 of the omelette over the middle. Shake the pan gently to slide the omelette to the edge of the pan and allow it to roll off on your dish! Serve with Red Hot, ketchup, etc. !